Weekly update: Keep riding, a few city meetings, and get ready for the fashion show! 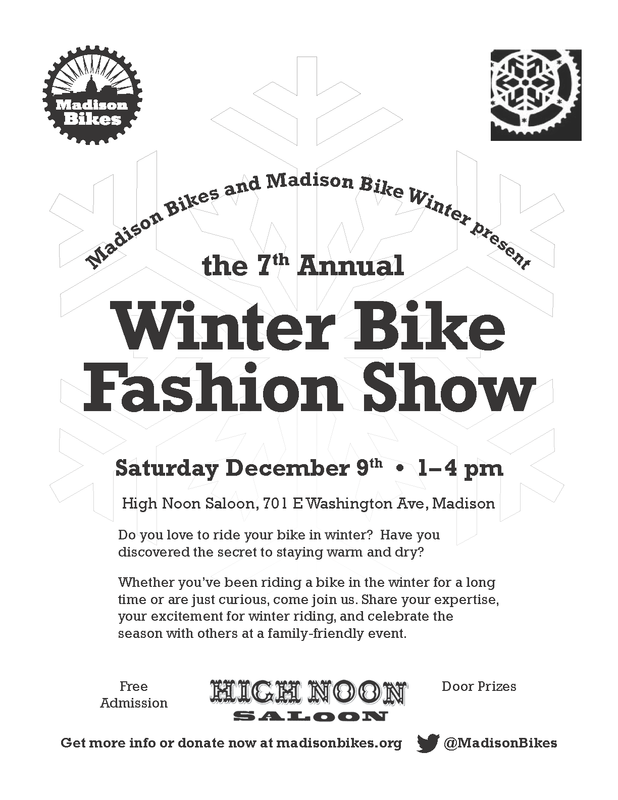 Although we still have over a week to go, the big news is that we are busy preparing for the Winter Bike Fashion Show on December 9 at the High Noon. Make sure to invite all your friends who are curious about how and why to bike in cold weather. You can even invite those friends who think we are all nuts; they may just have fun or gain a new respect for the cold-weather pedalers. We have a great roster of models lined up! Besides the fashion show, there are a couple of city meetings and a whole lot of fun cool/cold weather events to keep your blood and legs moving. Or, you can just be a spectator at the Cyclocross Championships on Saturday. Bike Fitchburg monthly meeting, 6:30-8:30 pm at the Fitchburg Public Library. If you live or work in Fitchburg or just care about what happens there, here’s a great group to influence policy in our neighboring city. MEAThead ride, starting at Fords Gym at 7:00 pm at 2114 Winnebago. This is a no-drop ride of Lake Monona with an optional loop through the Arboretum. If this sounds like fun, but you can’t make this one, it is held every Monday from November until March 6. The Pedestrian/Bicycle/Motor Vehicle Commission will meet at 5:00 pm in room 201 of the City-County Building. On the agenda is a resolution to proceed with development of a bus rapid transit (BRT) corridor running east and west. The eastern and western termini area still to be determined. More information is available in the documents for the meeting. While this is not strictly a bicycle issue, BRT can be a complement to improved bicycling in the city as part of a strong multimodal transportation system. But we will have to be careful that the BRT is not built at the expense of bicycle facilities that allow access to important destinations in the same corridor. Also on the agenda is a discussion of the continuing Imagine Madison planning process. You can watch the meeting streaming here. Also on Tuesday is another edition of the Tuesday Night Ride, a social no-drop ride averaging 10 mph. Leaving from Colectivo on the Square at 6pm sharp. Don’t forget your lights! This week they will stop by Alt Brew, hoping there will be a new Bicycle Benefits Madison, WI deal. The same two issues mentioned on the PBMVC agenda – the Imagine Madison update and the resolution in favor of the BRT Phase 1 will also be on the agenda of the Long Range Transportation Planning Committee on Thursday, meeting at 5:00 pm in room 108 of the City-County Building. The Cyclocross State Championships at the Trek Headquarters, 801 W Madison St, Waterloo. It's back for 2017! Once again, Revolution Cycles Club is promoting the WI State Cyclocross Championships. Expect thrills, spills, and chills on a technical course at Trek HQ! 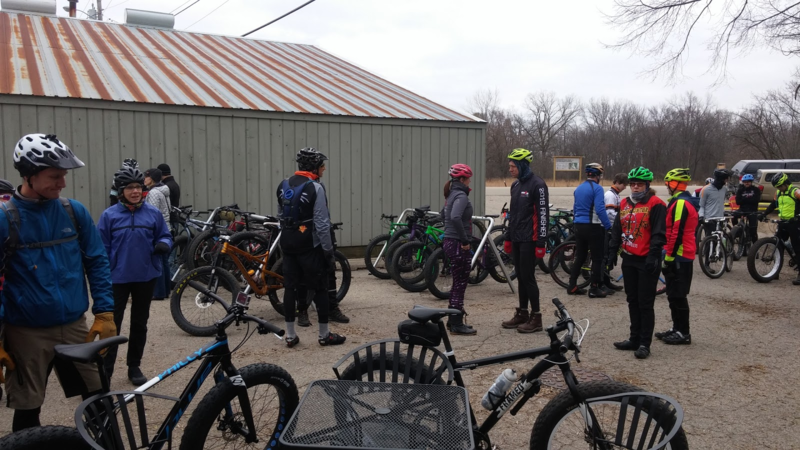 And if cyclocross isn’t your thing, then how celebrating Global Fat Bike Day at the CamRock Cafe and Sport, 217 W Main St, Cambridge. It will be the same day as the Cambridge Country Christmas, so there are events for the whole family. Details here. Group Ride at 2:00 pm. Lots of beverages (brews and non-alcoholic options) stashed at stop points around the trails. Fun back at CamRock Sport at 5:00 pm with Bonfires, Food, and more. All donations and all money raised for food, beverages, etc. going to the Bike Park. Music starts at 7:00 pm and goes all night. And somewhere in there the Badgers will be playing for the Big Ten title! Finally, to round out the week, come to the Cargo Bike/Café Domestique Shop Social, 1404 Williamson St. There will be warm beverages, a short ride, and the chance to learn more about the hosts. 3:00 pm: Meet for a hot beverage 3:30 pm: Roll out for a Lake Monona Loop. 4:30-6 pm: Demos/activities at Cargo and Café Domestique. Remember, we have all these events listed on the Madison Bikes calendar. If you would like to have an event listed, send us an email.